On January 16, an interdisciplinary group of Wellesley faculty and staff conclude an innovative three-day book studies workshop entitled “Teaching with Books and Other Textual Technologies.” The workshop was organized by Assistant Professor of English Sarah Wall-Randell, Theodora Stone Sutton Professor of Classical Studies and Professor of Classics Ray Starr, Curator of Special Collections Ruth Rogers, and Book Arts Program Director Katherine Ruffin, all of whom are involved with the Wellesley Book Studies Program. “The seminar has been so exciting and productive because book studies is fundamentally interdisciplinary, combining tools and approaches from history, art, literary study, philosophy, media studies, chemistry and materials science, to name only some, and so when we get scholars and practitioners and artists from many different departments together, we can study the book from a full 360-degree perspective,” said Wall-Randell. Participants explored strategies for book-oriented teaching and research. Individuals led short presentations about their research work or teaching as it relates to books or other media. Presentation topics ranged from papyrus fragments and Herrick’s Hesperides to 20th-century Japanese magazines, digital texts, and customer reviews of books on Amazon.com. Rogers introduced the group to Wellesley’s extraordinary collections of rare books, with a focus on artists’ books, her own specialty. 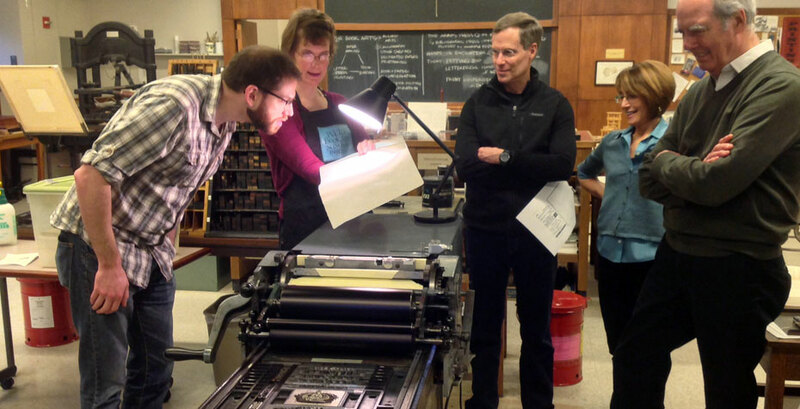 With Ruffin, the faculty and staff tried their hands at the processes of letterpress printing, paper-making, and hands-on conservation in the Book Arts Lab and the Conservation Facility (pictured). “This is not a new field, as evidenced by the growing number of both undergraduate and graduate programs in book studies internationally,” said Rogers. “In fact, much of this type of research and teaching is already being offered throughout the curriculum.” The goal of the program is to connect students to existing courses, to support those courses with hands-on experience through labs, rare books bibliography, and lectures on specific topics in the field. The workshop was sponsored by the Provost’s Office and Library & Technology Services, and made possible by the generous support of the Friends of the Wellesley College Library “Innovations in Reading and Scholarship” Fund.